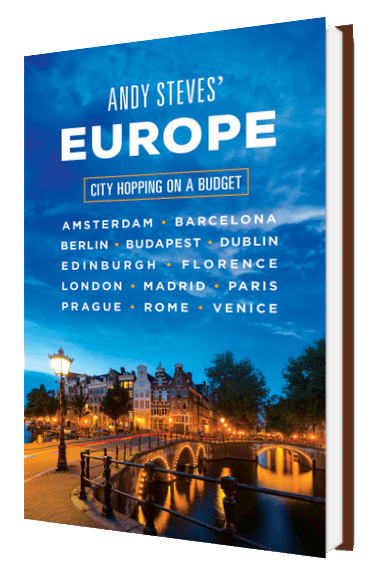 "I’ve grown up as the son of travel guru, Rick Steves. My mother, sister and myself went to visit him every summer of my life until I was 18. We would meet up with Dad halfway through his hundred or so days in Europe each year wherever he was on the continent. I remember visiting everything from small Bavarian towns in the foothills of the Alps, to bustling capital cities, and everything in between. Like any youngster, I didn't always love traveling with my family, having to go into museums and eat fancy food when all I wanted was a hamburger and fries." In 2005, I went on my first independent European adventure with my best buddy from high school, and it opened up a whole new continent. Starting in Amsterdam, we did a grand tour through Paris, Madrid, Barcelona, the French Riviera, the Cinque Terre and the Swiss Alps. We even caught the Tour de France in the French Alps and took two night trains in a row to Palermo before concluding in Florence and Rome. The next summer, I spent two weeks in a language school and worked for the next seven weeks as an assistant tour guide for my father’s company for “Family Friendly” tours that went from Rome to Paris through the Alps. I've been uploading my blog from this trip here. The next summer, I met up with my cousin in Seville as he was finishing a study abroad program for a few days, than made it to Rome to start another couple tours. I also did a Scandinavian and “Paris/Normandy family friendly" tour. Not being able to stay away from the European continent for long, I went back in 2008 to start my semester abroad in Rome, where I quickly noticed a real need for student travel ideas. I first spent a week in Prague, and then throughout the semester, hit Venice for Carnevale, a ski trip in Switzerland, the Amalfi coast, Dublin for St. Paddy’s day, Sicily for spring break, the Cinque Terre, Milan and a small hill town in Tuscany. Once the semester ended, myself and five friends chartered a 40 ft sailboat from Athens and toured the Aegean, before I spent a week in Istanbul and one more in the Swiss Alps. You can find more on these adventures in my blog. The WSA concept began development as soon as I returned from my semester abroad in Rome, Italy during the Spring of 2008. After traveling 13 of my 17 weekends abroad and organizing a number of trips for myself and friends, I designed over 20 recommended weekend itineraries to top destinations across Europe. I began giving travel workshops at universities including Notre Dame, Saint Mary's College, University of Michigan and Brigham Young University. I vetted the feasibility of starting a weekend tour business in Europe through Notre Dame's annual business plan competition in the spring of 2009 and 2010. After making it to the semi-finals in 2009, I recruited a small team to take the concept to the top in April of 2010 and won first place out of over 100 entries! WSA continues to grow and lead the industry with the accessability and popularity of study abroad. Our team of expert travelers and local guides devlop engaging, unforgettable trips for students with our weekend trips and DIY Detours. Our travel workshops have expanded rapidly, and today the WAS Team presents at over 40 universites and abroad campuses every semester. Want the latest on what we're up to? Join our travels on Facebook and our 5-star rating on Trip Advisor!